It is self-evident that no number of men, by conspiring, and calling themselves a government, can acquire any rights whatever over other men, or other men’s property, which they had not before, as individuals. And whenever any number of men, calling themselves a government, do anything to another man, or to his property, which they had no right to do as individuals, they thereby declare themselves trespassers, robbers, or murderers, according to the nature of their acts. The ever-angry Blacks and those ethnoguiltists who pander to- and enable their misbehavior will tell you – quite stridently in some cases – that the NFL players who’ve refused to stand for America’s national anthem and/or who have started using gang / terrorist symbology on the playing field are making a statement. 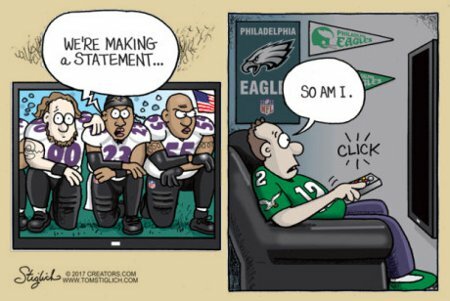 Of course, these same ever-angry Blacks and ethnoguiltists are angry that Americans, most importantly and especially the large subset of Americans who’ve enjoyed and patronized the NFL, are also making a statement…by not attending games, by not watching the games on TV, and getting rid of- and/or not purchasing NFL merchandise. But, of course, not all messages were created equal. The message, mostly due to the Blacks’ chosen means of sending of sending it, being sent by the NFL players was rejected by the American people, whereas the message we sent is having a noticeable effect. 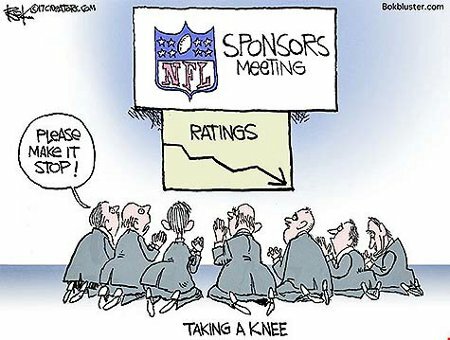 Both the NFL and their sponsors are taking a knee in supplication, propitiating we, the People to withhold our wrath. That’s the nature of statements. Some are worth making and others aren’t. Some ways of making a statement lead to a positive result and some lead to destruction. This entry was posted on Friday, September 29th, 2017 at 8:44 am and is filed under Politics, Society. You can leave a response, or trackback from your own site.